An island nation has vanished. Men of honor and magic have died unnatural deaths. Slaves flee in terror. . . . Are the silent gods beginning to speak? Or is another force at work in the Lands Vin? Laura Anne Gilman’s critically acclaimed, Nebula Award–nominated Flesh and Fire introduced a brilliantly imagined world where the grapevine—cultivated by the Vinearts who know the secrets of wine magic—holds together disparate lands. Now, confusion, violence, and terror are sweeping over the Lands Vin. And four people are at the center of a storm. Jerzy, Vineart apprentice and former slave, was sent by his master to investigate strange happenings—and found himself the target of betrayal. Now he must set out on his own journey, to find the source of the foul taint that threatens to destroy everything he holds dear. By Jerzy’s side are Ao, who lives for commerce and the art of the deal; Mahault, stoic and wise, risking death in flight from her homeland; and Kaïnam, once Named-Heir of an island principality, whose father has fallen into a magic-tangled madness that endangers them all. These four companions will travel far from the earth and the soul of the vine, sailing along coastlines aflame with fear, confronting sea creatures summoned by darkness, and following winds imbued with malice. Their journey will take them to the very limits of the Sin Washer’s reach . . . and into a battle for the soul of the Lands Vin. For two millennia the Sin Washer’s Commandment has kept these lands in order: Those of magic shall hold no power over men and those princes of power shall hold no magic. Now, that law has given way. And a hidden force seeks the havoc of revenge. 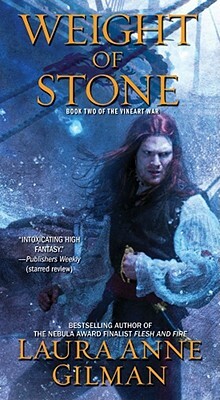 An adventure through an unforgettable realm conjured by breathtaking imagination, Laura Anne Gilman’s saga of the Vineart War is a "dramatic, authentic, and potent" (Publishers Weekly) literary delight.